The former Macy’s store at the Paseo Nuevo mall in downtown Santa Barbara. Addressing loitering and panhandling and encouraging more mixed-use developments that include residential are among the recommendations to revitalize State Street in a retail strategy study released by the Downtown Organization of Santa Barbara on June 9. Seattle-based retail consulting firm Downtown Works said that loitering by homeless people is perhaps the biggest challenge facing State Street and suggested that Santa Barbara look at how other cities manage the homeless. 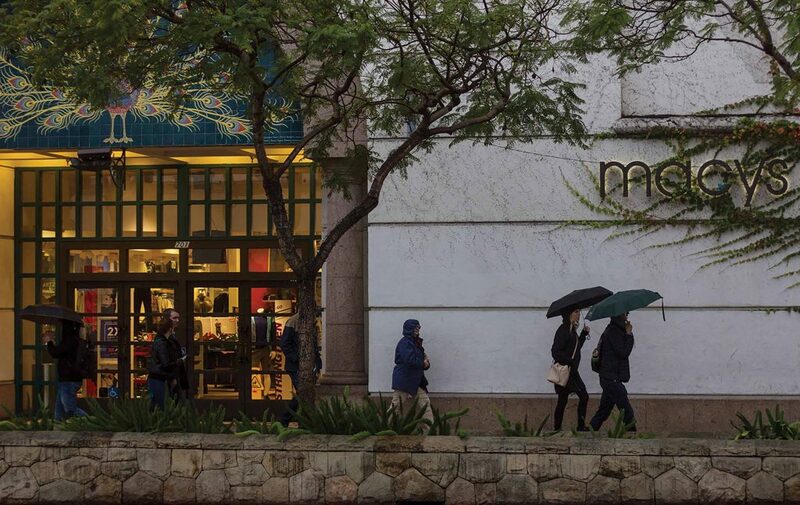 The study says the former Macy’s site in the Paseo Nuevo mall offers a prime opportunity to improve State Street and the city should encourage residential development along State Street to bring steady traffic to retailers. It also concluded that the mix of retail on State Street is not unique enough, with too many similar stores, for example selling T-shirts or gifts, and too many mall-type stores that can be found elsewhere and appeal only to a very young demographic. The study found that the mix along State Street from Cota to Victoria streets currently is 53 percent stores, 22 percent food and beverage, 3 percent personal care, 2 percent arts and culture, 7 percent non-retail such as banks and offices and 12 percent vacant properties. It suggested an ideal use mix would be 53 percent stores, 31 percent food and beverage, 12 percent personal care and 4 percent arts and culture. The consultant said high rents are not the cause of so many vacancies on State Street and the most important factor is the quality of the stores already in operation. McCauley said that high rent means high sales, and the eye-popping price tag on real estate should be an attraction for potential retailers. McCauley said the retail stores on State Street need to do a better job attracting foot traffic. Approximately 28 percent of the 135 retail storefronts in the study area scored below standards in terms of the experience they offer. McCauley suggested hiring a retail advocate to champion both retailers and landlords — advising store owners on how to attract more customers and working with landlords to find suitable tenants. Other issues such as sign restrictions and store facades needing improvements also factor into State Street’s retail struggles, according to the report. • Contact Chris Officer at cofficer@pacbiztimes.com.